Automatically change store view, currency and language depending on visitor's location. Expand your business across other countries without creating a separate store. Broaden your business horizons with Magento 2 GeoIP extension to other countries and let your foreign customers shop easily with multi-language, multi-currency and multi-store functionality. Set introducing confirmation and notification pop-up before redirecting. Comply with the requirements of EU regulations regarding geo-blocking and country redirects. The module automatically determines visitors’ location and redirects them to the correct store view. With the help of the extension you can improve customers' shopping experience by showing localized information in familiar language and currency. The extension detects location of your store visitor using GeoIP technology and changes price currency to the one which is actually used in the potential customer’s country. Also your customers don’t have to choose the language prior to start purchasing - it will be done automatically. See other ways of how to apply geolocation to make your marketing more efficient. Block certain visitors by their IP addresses and choose the CMS page that will be displayed to the restricted customers. Sometimes a user may need to see particular pages of your store just as they are (e.g. product pages). In that case you can enable ‘Redirect From Home Page Only’ option. Thus, as soon as viewers enter the website homepage, they would be immediately and automatically redirected to the appropriate store view. Redirection rules are based on users location, and if customers enter a specific page it will be displayed in the original. Configure country to store view rules and to show familiar language and currency to users from all over the world. Use this option to redirect your customers to a specific store page, blog or your youtube channel based on their location. For example, if you don’t provide delivery of some items to specific countries or regions you can redirect users from these regions to the page with the information where they can buy this product offline or find out more about your company. Redirect customers to content to draw more attention to your brand. In case you want to keep the URLs like home or FAQ page the same for all store views, you can exclude them from redirection. At the same time you can apply redirect option only to the certain store pages, e.g. Delivery info or Contacts. Avoid SEO risks caused by redirects, see how. Now you can choose whether to adjust your webstore to users’ geolocation automatically and redirect them each time they enter your website or to allow them to choose which store version is more convenient. In this case they will be automatically redirected only during their first site visit and then will be able to choose which store view to use. This feature works for both guest and registered customers. 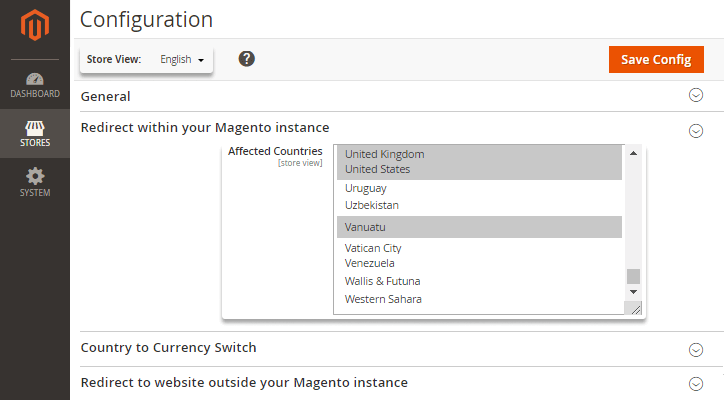 Speak the same language with your customers using our Magento 2 Blog plugin. Let your visitors share their opinion in comments and establish a dialog with their vendor. How can I make Varnish Cache compatible with redirects? Basicly, GeoIP redirect module is the Magento 2 extension and is not compatible with Varnish Cache. Magento 2 utilizes App Server and when you use Varnish Cache for your website the redirect functionality will not work properly. However, you can bring partial compatibility. How to fix the execution time limit of PHP scripts when importing the database? How can I test redirects for different countries in M2? You can use a VPN service or an anonymizer to change your authentic IP address to a required one (geolocation) and see whether everything works smoothly. Read on to see all the possibilities. I’d like to say the module is not bad at all. However it hasn’t been without problems. When choosing us dollar currency it wouldn’t save. I racked my brain till the tech group helped me with that. it turned out that problem was on my side and their devs didn’t refuse to help me. Thanks a lot! Could it be possible to implement the browser language as a choice for switching? Currently we have several storeviews for a country which has more than 1 official language. The geo-ip sometimes does crazy things like redirecting to be_nl/fr_nl/something when two storeviews are linked to the same country. Maybe using the browser language we could prevent this from happening? I don't know how it happened but I decided to roll the dice before xmas sale and installed the module a few days ago. When I didn’t manage to import the doc I thought it’s all gone. Happily the support worked that day and did everything just in 2 hours, good job! What I liked most is that google is ignored by default, so I didn’t have to do any additional manipulations. Finally my visitors don’t have to choose the right version manually. I’ve use it for 3 mnth only but already received many positive feedbacks from my regulars. I had some troubles with my french store view but mistake was on my side. Anyway, the guys from support are very responsive and even agreed to talk to my admins, so we solved it soon. I agree w/ my friend that we are free to choose what we want. But I think when I buy an extension form a premier builder I’ll see no troubles. I don’t think so, I’ve saw people complained about the glitches w/ docs importing, yes, I had them too and this was the most annoying thing and it was not on my part. I had to wait for 3 days the module will finally work well after the support check. Thanks to support team they are really great, hope you’ll make the moment smooth. The choice of countries and currencies amazes but it didn’t go well with setting it up. It would be great if your demo had some preselected settings, so i can see what I should put here and there on the go. As a whole, the module works well, with a ‘little help’ from support team, of course. I did each and every setting without any help. Yeap, though I went a few rounds with use website config, as the settings applied not only to the main website but to all the store views, I can say that if you read the user guide and notes in the backend, you’ll do it in one fell swoop. I really don't know why people say they had troubles with uploading geoip data docs as I had no problems with that. Probably, there were troubles on your side. As for the features, excepted urls played right into my hands as most of my staff work outside Italy. I really spent time to deal with user agents, otherwise, the plugin works well. I wanted to import my own Geo Ip data docs, but they didn't upload properly, so I had to bother support assistants to help me out. Finally, in about 3 hours they replied and generated the file according to my needs. Now the module works the way I want. I started with importing my database an’ failed then I received the error note on the absence of csv addressed to tech help they redirected me to the guide where it's said not to take the error into account. So, I have a question for you. Won't it be simpler not to confuse people with the error note at all? Eventually somehow I launched the module and now it works fine but without the tech help I wouldn’t manage to run it. – Compatibility with the FPC extension is added. – Improved import of GeoIP data. – All URLs" option is deactivated. – All Except Specified URLs" option is active by default. – Restriction by Ip" is renamed to "IP to Ignore" for better understanding. – Fixed: setting "First visit redirect only" didn't influence on setting "Enable Country --> Currency"/"Enable Country --> Store View". For repeat visit currency/store were the same.